People are more engaged than ever in managing their healthcare needs, and the web plays an essential role in how patients interact with their providers. From researching treatment options and requesting appointments to looking up location info and paying medical bills, effective hospital websites play an important part in the patient journey. Logansport Memorial Hospital’s new modern healthcare website redesign project is already helping the healthcare provider better meet their marketing goals. Some results so far include a 69% improvement in site speed, a significant increase in lead generation, and a 42% improvement in the mobile bounce rate. We chatted via email about the project with Carmen Jones, Logansport Memorial Hospital’s director of marketing and community relations, and TBH Creative project lead Tatum Hindman. Their responses—below—have been condensed and edited. Why was Logansport Memorial Hospital looking for website redesign help? Carmen Jones: Our previous hospital website had been refreshed back in 2013 when web design trends were different and we had different goals. Fast forward to 2018, and we knew more about what our patients wanted from their online experience when using our website, thanks to ongoing monitoring and reporting, handled through our partnership with TBH Creative. It just made sense to reorganize some of the content in different ways and make some content areas more prominent so that users could find what they need—when they need it—quickly and easily. What did TBH Creative do to help the Logansport Memorial Hospital team meet its website marketing goals? Carmen Jones: TBH Creative was there from start to finish through the entire process. Our team has very little experience in web design and coding, so we relied on their recommendations and expertise to conceptualize and execute our new website. TBH Creative led our team through the entire redesign process–from planning and architecture updates to proposing an entirely new design with various new components to meet our needs. We also simultaneously upgraded our content management system so that we had more ability to meet different marketing needs using our website as a call-to-action (e.g., generating friendly URLs). Tatum Hindman: In our partnership with LMH we have always taken a phased and prioritized approach. Formally, at the start of each year, we meet to talk about their goals and create a strategic digital marketing plan, then—throughout the year—we track progress and make refinements. Sometimes we even push LMH (respectfully) to try new things and consider entering unfamiliar territory that requires reconsidering business procedures. For instance, we have helped LMH set-up systems to track and measure results from all their marketing initiatives. Be proactive—using data as your guide. What did the Logansport Memorial Hospital team think of the finished website? Carmen Jones: We are very proud of our new and improved website, and we are incredibly pleased with the feedback we have received from others, too. In our small community of Logansport, not all organizations have the capacity to devote extensive resources into making their websites user-friendly. But, as Cass County’s community hospital, we know that our patients rely on us for a critical need: their healthcare. 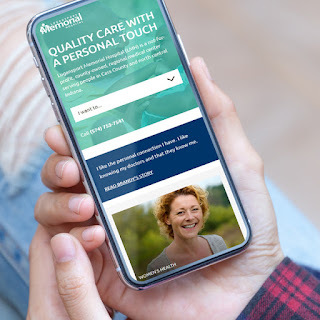 We want to be a resource for them and meet them where they are as they are researching or learning more about what options they have for healthcare, and we want to connect with them at any point in their journey to build their trust and confidence in choosing us as their care provider. Having a website that employs the latest design trends and is thoughtfully optimized and organized will help us do that as effectively as possible. What helped make this healthcare website redesign project successful? Carmen Jones: TBH Creative’s innovative approach to web design is what continues to make any project successful. This redesign was carefully executed from start to finish with a process that was well-managed and easy to follow. Their innovative creative direction yielded a truly successful result. My coworkers devoted a lot of time and effort into managing the later stages of the project while I was out on maternity leave, and our finished healthcare website redesign project would not have been successful without a seamless transition between our team and TBH Creative. We are all grateful to have TBH Creative as our web design and digital marketing partner, both now and for many years to come. Clients who are curious, like our partners at Logansport Memorial Hospital, are often the same people whose website projects launch on time because they’re 100% invested in its success and know how crucial clarity is to meeting milestones. Don’t let miscommunication keep you from hitting your target “go live” deadline. Tatum Hindman: Several things helped to make Logansport Memorial Hospital website project successful.